Three weeks after the protests in Hong Kong began in earnest, student protest leaders and government officials held a long-awaited dialogue. The Hong Kong Federation of Students, one of the main groups organizing the protests, was represented by Alex Chow, Nathan Law, Yvonne Leung, Eason Chung, and Lester Shum. Carrie Lam (Hong Kong’s Chief Secretary), Rimsky Yuen (Secretary for Justice) , Raymond Tam (Secretary for Constitutional and Mainland Affairs), Edward Yau (Director of the Chief Executive’s Office) and Lau Kong-wah (Undersecretary for Constitutional and Mainland Affairs) represented the Hong Kong government (although neither Yau nor Lau spoke at the meeting, much to the amusement of Hong Kong netizens). The entire two-hour discussion was broadcast live to protest sites around the city. Both government and students continued to stick to their basic positions throughout the dialogue. Carrie Lam, who acted as the main speaker for the government, emphasized that students should not be so quick to reject the National People’s Congress Standing Committee (NPCSC) decision on Hong Kong’s electoral reform. 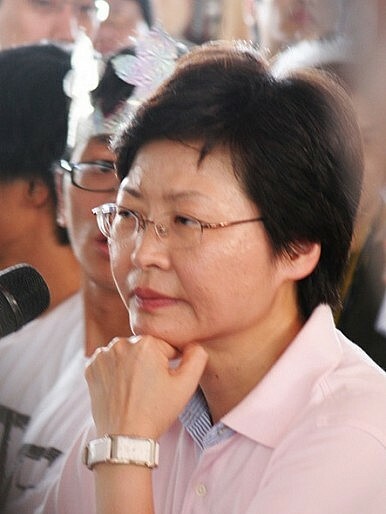 She and other speakers for the government emphasized the diversity of public opinion on this issue: some Hongkongers are for the NPCSC decision, and some are against it. Accordingly, Lam said, the students must take other voices into account. Lam also emphasized that the NPCSC decision represents incremental progress, not a final decision. Lam said there was still room for dialogue within the framework of the NPCSC decision. Working out the nomination procedure will be a goal of the second round of public consultation, Lam promised. Still, she cautioned protestors to remember they will not get everything they want. “It is not realistic to think a proposal for public nomination can be passed by the legislature” due to pro-establishment opposition, South China Morning Post quoted Lam as saying. Lam instead told the students to hold out hope for larger changes in the process for the 2022 election, rather than the next chief executive election to be held in 2017. The framework suggested for 2017 is not final, Lam said, but a stepping-stone to further reform. “We can still improve the system for 2022,” she said. The implication was clear: pro-democrats should take what is offered now and hope for further reforms in the future. If they hold out on the issue of nominations, Lam and the other secretaries cautioned, then the universal suffrage planned for 2017 will not happen in any form. “You cannot only have idealistic pursuits. You have to be pragmatic,” she advised the protestors. The students, however, demanded that the Hong Kong government push harder for democratic reforms in the Special Administrative Region. “It is the Hong Kong government who is giving up its responsibility. It has the constitutional duty to fight for a democratic reform proposal for Hong Kong and then pass it to the legislature to vote,” student leader Yvonne Leung said. “You should not sit and do nothing just because NPCSC is involved in a later stage.” In effect, the students believe the Hong Kong government should be challenging the NPCSC decision, rather than taking it as a fait accompli. No one was expecting an end to the crisis to become immediately apparent from these talks, and the discussions described above show that considerable deadlock remains. However, there were two proposed outcomes, although details on both remain vague. First, the government expressed interest in working with the students to set up a platform that would allow the public to voice their opinions on long-term constitutional development. The platform would be used for the next round of public consultations on constitutional reform. At this point, there are no details on what such a platform would look like or how input received in this manner would be used. Second, the government said that it would consider submitting a report on public sentiment in Hong Kong to the State Council’s Hong Kong and Macao Affairs Office. The protestors believe that the government’s initial report on electoral reform, which was submitted to the NPCSC prior to its decision, glossed over public opinion (a charge Lam roundly denied in the talks). The protestors have asked for a new report to be submitted to the NPC. While the government had said that will not happen, it held out the possibility of a report to the State Council as a compromise. Lam told the students that recording public opinion in Hong Kong and expressing it to the central government in Beijing would be good for democratic development. Again, there are few details on how public opinion would be measured for this second report, although officials indicated in a post-dialogue press conference that they would include public opinion surveys.